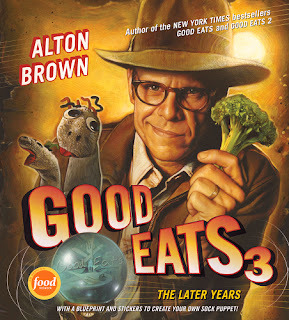 I went to a book signing for Alton Brown's new book Good Eats 3, and before the signing started, he gave a little talk, then fielded a lot of questions from the audience. It was entertaining. When his little talk was over, the book signing began. I've got to give the guy credit. He made a point to tell the organizers to allow people with small children to move ahead in line - a brilliant idea considering how long the wait was. And he was on his feet the whole time. Yep, he didn't sit at a table, he signed books at a podium. We got to sit around while we waited for our numbers to be called for the signing, but he was on his feet from the time he walked into the room until it was over. I haven't quite had time to cook anything from the book. Well, that's not exactly true. I've made a few recipes that are in the book, but I made them from recipes as they appeared on the Food Network website. Because, yes, the recipes are available on the website. Browsing through the book, I can tell you that I already made the tres leches cake, the dulce de leche, and hummus. And yes, I liked all three of them. I think I might have used his corned beef recipe the first time I corned my own beef, but that's some time ago, so I don't recall for sure. But, as Alton (my new BFF) said, the recipes in the books are a little more detailed, with better descriptions and explanations. And of course, there's all the show information and little tidbits of science, and some humor, as well. I've also made recipes from his other books. I wrote about the first Good Eats book (the early years) here and here, and I wrote about the second book (the middle years) here. Alton and me. We're buddies, now. When he was a kid, he wanted to be a film maker. What he learned in culinary school was that you don't have to go to culinary school. When he first started working at Food Network, the on-air personalities who were nicest to him were Bobby Flay and Mario Batali. His favorite movie is Jaws. His favorite Iron Chef is ... all of them. He was pretty funny about it, but he wouldn't name a favorite. He will be on every episode of The Next Food Network Star next year, and he said the show will be "brutal." When someone asked for tips on how to get on the show, he said, "Don't do it." Alton Brown never eats the food on Iron Chef because during the original Iron Chef Masters series he became seriously ill and was hospitalized because there was an ingredient he didn't know about in one of the dishes - oysters. He didn't see it go into the dish, and the chef didn't mention it. So now he doesn't eat anything on the show. Trout ice cream is the worst thing he ever ate. Ever. His favorite secret ingredient on Iron Chef is one that hasn't been aired yet - yak. There's a dark chocolate episode of Good Eats coming up in the 1-hour format. And a new Thanksgiving episode. The Dark Chocolate episode got a round of applause. He has a science-based show in the works that is not about food. He also has a short series in the works for Food Network. He didn't know what a "hall pass" was. Now he does. I'm not sure he wanted to know. His favorite place to ride though on Feasting on Asphalt was the Appalachia area. He won't autograph living things; he will sign your cast, but not your arm. He had a nutmeg in his jacket pocket. The nutmeg also got a round of applause. His favorite dessert to make is pie. To help him lose weight, he gave up drinking milk. Not that he had any problems with milk, but milk whispered in his ear about cookies or cake. Or more cookies. And, he said, everyone knows that a box of girl scout cookies is two servings. So when he gave up drinking milk, he found that he didn't succumb to the cookies or cake as much. The props on Good Eats purposely look cheap. And usually they are. The suction cups on the giant squid that shows up at the end of the squid show were made from a bathmat. He feels that giving up diet soda played a huge role in his weight loss. He says that drinking all that sweet stuff accustoms you to having a lot of sweets. So eating a giant bag of chocolate candies seems normal to your body - but it shouldn't be. There is a sock puppet template in the back of the new cookbook. Cooking Channel will be running all the episodes of Good Eats in the order they were originally aired. Alton Brown is afraid of monkeys. Or maybe just sock puppet monkeys. During Iron Chef, Alton can watch feeds from eight of the cameras. There are more. I think he said 13. After the taping, he dubs in information about important things that he missed during the live action. He referred to himself several times as a film maker. He didn't do well in science classes when he was in school, so he had to learn it all on his own when he saw how it applied to cooking. This book has all the recipes from the last shows of the series, except for the last three. He was a genuine guy. I'm glad I had a chance to see him in person. My number for the book signing was 310. He was starting to look a bit ragged by then, but he smiled and signed books and posed for photos. What more can I say? I'm still a fan. I had received a review copy of the book prior to the book signing, and I don't need two - so I have one copy to give away. No, you're not getting the signed one. That's mine. To enter the contest, leave me a comment telling me what your favorite episode, character, or recipe was on Good Eats. 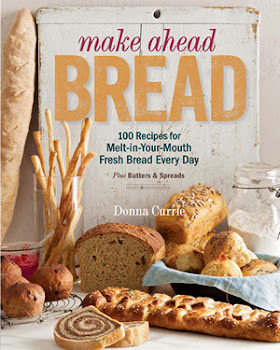 For an additional entry to this contest, tweet a link to this contest, and include @dbcurrie in the tweet. Leave me a second comment telling me that you have tweeted. And that's it. Two entries per person, US and Canada only. Contest begins when this is posted and ends on Sunday, October 23 at the stroke of midnight, mountain time. Winner will be chosen randomly and will have 48 hours to respond before I pick another winner. Good luck! The lucky winner is SARAH ! Congrats! And thanks to everyone who entered. These comments were so great to read. I am forever grateful for an episode where Alton Brown made his own smoker and made ribs. Carnivore fiance saw this episode and finally realized that Alton isn't weird, he's awesome. Like I haven't been trying to tell him that this whole time. I always have to watch the CHEESECAKE episode. He taught me how to make the best - evah!! hard to pick a favorite! I love the one where Alton plays a Colonel Sanders-type gentleman making pineapple upside-down cake. Also, the cheesecake/Elvis episode and the biscuit episode with his grandma are both brilliant. I can't choose ONE! He's had some awesome episodes and I love his mix of cooking and science. You know I don't tweet much but you've been tweeted! My favorite was the Dulce de Leche episode because it was the first one I ever saw and I was so blown away by how Alton Brown presented information. I fell in love with Good Eats that day! There was an episode about dips once...they all looked awesome. And I love the ep where he made a food dryer thingy (the name is on the top of my tongue) out of fans. How cool! And what interesting facts :) One of my favorite episodes was the brownie one. Who doesn't love brownies? Fun post! I especially love the comment on losing weight by giving up milk, since the milk is calling out for cookies and cake :-) Can I still enter if I've never watched a single episode of Good Eats??? <3 Good Eats. Was my favorite show. My favorite episode? The pizza dough one. Inspired me to start making pizza, and on a pizza stone. I retweeted this btw :) great, fun giveaway. My favorite recipe is probably the creamed corn cornbread from the early years. Sub Standards. It's very clever and is one of the funniest in my opinion. I love the meat pies episode! I love the episode where he does an intervention of sorts on a grown-man still having his mom cook all of his meals. He teaches him to cook for himself and in usual Alton Brown form, it's hilarious. My fav recipe is for his overnight cinnamon rolls! I LOVE Alton's soft pretzel recipe. Better than anything I've ever gotten at the mall or sports arena, or from a street vendor. My (huge) geeky side loves Alton's approach to cooking. My favorite episode was one with his nephew. The nephew was distracted by a girl. Alton told him if he ever wanted to be able to cook up some bait to catch one of those someday, he'd better pay attention! Favorite recipe is his fried chicken, probably because my hubby cooks it! Second is the brined turkey, a regular that I cook. I bet the best thing about the book is you don't get a pop-up advertisement every time you look for a recipe!! I love Alton Brown, he is one of the few famous food people I respect. You're lucky that you had the chance to meet him! My favorite, if I had to choose, would be the one where they are Germans. I laughed my socks off with that one. I love Alton. He is really who got me interested in cooking something other than what I grew up with. I have all his books, just haven't had time to get to the bookstore to pick this one up. the chocolate chip cookie episode. i never thought i'd learn anything new about chocolate chip cookies but i did! Alton is my favorite all-time foodtv celebrity. I met him at a book signing ages ago for his first cook book. I must admit, I find it difficult to watch old episodes of "Good Eats" sometimes, because it makes me so intensely homesick for Georgia. My favorite episodes are the ones featuring the belching yeast sock puppets. Brilliant. I love good eats. I don't have a favorite show really because they are all great. So I'll go with the first show I saw that hooked me. It was the episode all about corn, it made me a good eats believer!! Gosh, so many great recipes, it's hard to choose. I think my favorite may have been the baba ghanouj (eggplant show), or one of the chocolate episodes. Picking a favorite is not possible- Alton is just geekygoodness ! Funny, articulate and a fellow food fan! Tweeted -BAm! I recently saw one about Lentils that I thought was very helpful as I have several bags of lentils that I didnt know what to do with. 'Q' is my favorite episode, my homemade little brown egg still works great! Very cool pic of y'all! I LOVE Alton!! I enjoyed reading the facts you wrote about him too! His pancake/biscuit mix is my favorite recipe and one I use all the time. I make a large batch of the mix, then every Sunday I make pancakes. Anything we don't finish gets flash frozen and eaten during the week by my hungry 3 year old. They come out fluffy every single time. I've used it to make copycat Red Lobster biscuits as well. I love love love Alton Brown! I'm still waiting to see him here in my local harry's Farmer's mkt in Atlanta! Tweeted! Even added Alton Brown's twitter handle! Fingers crossed I win or that Alton tweets me back. Either way...score! ooops forgot the link to the tweet. The garlic episode with Vlad cracked me up, and the episode about deep fat frying a turkey with it's epic fireball was amazing. My favourite character is W, of course! The haggis recipe/scene just about killed me from laughter. Classic! Favorite episode?? Hmm...I'd have to say the one on making pie crusts. It's the only pie crust recipe I use now. Plus the puppets were hilarious. Hugely tough question, but I think I'm going to go with Brown's mac & cheese. I've made many and that's still a favorite. It's so easy to have a smart-girl crush on Alton! My fav episode was the first one I saw. Don't remember the title, but it was 30 minutes of how to make a hamburger, from selecting the meat, grinding it, frying it, dressing it on a bun. It was stunning to see an entire show devoted to the how and why of a single food item. I became a fan immediately. the show is called "Good Eats" not Serious Eats. Anne, I wish I could give you a prize just for that comment. I write for Serious Eats and my fingers are so used to typing it ... and after re-reading that post so many times, I never saw it. Good catch! Oh I love love love Alton Brown and his show Good Eats. I love all the shows but one that really changed the way I was doing thing (all wrong may I add), is Steak Your Claim. I don't get cable so I haven't seen any of the episodes. I would love to get the book, he sounds very interesting. And the winner is .... SARAH (with an "h") Congrats! I know you'll love the book!